A shed is a wonderful addition to any backyard. It serves the practical purpose of storing lawn equipment, keeps the garage de-cluttered, and also adds personality to the backyard itself. Sheds can built in several styles to serve aesthetic purposes. They can also be small and quaint so they do not take away from the backyard itself. However, the material used to make a shed can cause problems. This is why if you are looking to add a shed to your backyard, understanding the different materials used to make them is beneficial. Vinyl sheds are the cheapest option you can find. This does not mean that they are sub-par however, in fact vinyl sheds are some of the best sheds on the market. They look great, are very durable, and require minimal maintenance. They differ in quality standards and that can affect price, but they definitely avoid the problems found in wood. A vinyl shed will never rot, moisture does not pose a problem, you do not have to worry about painting them, moss will not grow in areas of humidity, and they are built to last. Unfortunately, Vinyl sheds do not look as appealing as other sheds do. Many are designed to look like wood but they never really pull it off. Vinyl sheds in KY can come in bevy or popular styles like a Lean-To, Gambrel, or Gable. 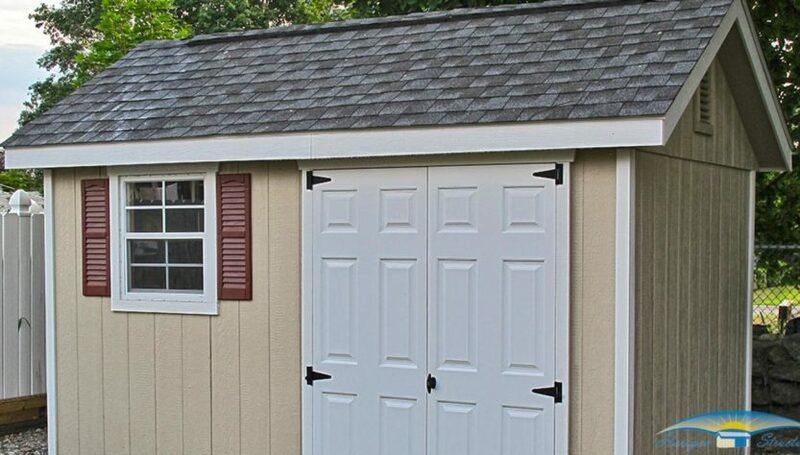 Metal sheds are just as sturdy and long-lasting as Vinyl sheds with a few perks. They are insect proof and fireproof as well. This is nice as some sheds become host to lots of creepy-crawlies. Metal sheds are used by the professional crowd. They stand up to all kinds of weather and are overly practical. This is good from a business standpoint. Metal sheds are also great for DIY-ers as they are by far the easiest sheds to build. Most vinyl sheds come pre-made and wood sheds are a huge project to undertake. The durability of a metal shed comes mostly from the metal used. Aluminum sheds are cheaper but dents easily. They also have thin roofs that are a problem in harsh weather. Steel is stronger but more expensive. No matter what type of metal is used though all metal sheds can rust. This is their biggest setback but can be avoided with care. Wood is the Granddaddy of sheds. It is also the classic element that people adore. It is still he most popular form of shed because of the overall look, feel, and variety it can provide. Wood sheds can be constructed to any parameters and can look absolutely gorgeous. This aesthetic appearance is a trade for durability though. Wood can be affected by moisture, it takes a lot more care to maintain, it is not impervious to insects, and it can rot. This can be avoided with proper care but that care requires much more attention than the other options. Wood is so flexible in the way it can be constructed and built that despite these setbacks it is still an ideal choice.